Communist Party of Philippines: On Duterte’s demand to hold talks in Philippines | Fight Back! Fighters from the New People's Army. Fighters from the New People's Army. Fight Back News Service is circulating the following June 20 statement from the Communist Party of the Philippines. By insisting to hold NDFP (National Democratic Front of the Philippines) -GRP (Government of the Republic of Philippines) peace negotiations in Manila, Duterte is putting forward a demand it knows is totally unacceptable to the revolutionary forces. It is like the NDFP insisting that peace talks be held in the territories under the political authority of the revolutionary forces—something that Duterte will definitely not accept. In the demand to hold the talks in the Philippines, Duterte is practically scrapping The Hague Declaration of 1992 and, by consequence, the entire peace NDFP-GRP peace negotiations itself. He also wants to trash all the past efforts of the Royal Norweigian Government as Third Party Facilitator. Duterte is showing complete antipathy towards holding serious peace negotiations with the NDFP, and merely wants to hold hostage and completely paralyze the talks. He wants to use the cancellation of the agreements to resume talks with the NDFP to justify his total war under Oplan Kapayapaan, and advance his scheme to establish a fascist dictatorship and impose nationwide martial law. By practically scrapping peace talks, Duterte is removing all impediments to the campaign of all-out offensives, aerial bombardments, forcing thousands of civilians to “surrender” as armed rebels, extrajudicial killings ala Tokhang, and other grave abuses by the Armed Forces of the Philippines (AFP) against the peasants, national minorities and other oppressed peoples. Duterte vainly hopes to crush the NPA militarily before the end of 2018. 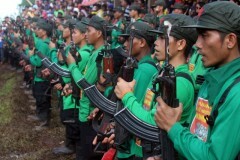 The NPA will surely frustrate the aims of the Duterte regime by waging extensive and intensive guerrilla warfare. Duterte is rousing the Filipino people to unite, fight back and oust his despicable fascist regime.